Download this document as a word file or PDF. This is a revised version of the paper presented on Tuesday 23 October. It remains a draft, and should only be quoted after specific permission. 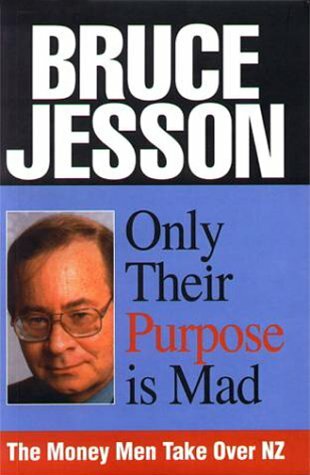 I did not know Bruce Jesson as well as many of you in the audience, although I may have known him longer, for we went to the same high school. Bruce was in my younger brother’s class, so I only just knew him then. While I have a memory of him gawky in the dreary gray school uniform, it may be this is re-created because we all looked awkward in the uniform, so it is easy to imagine with hindsight. We did not overlap at university, but I recall being stunned by the occasion in 1966 when Bruce and some friends burnt a Union Jack in front of the governor-general, asking why we were upset about damaging a foreign flag, We were already refusing to stand up in the cinema for “God Save the Queen”, but that protest lifted the level of analysis, challenging us to think more deeply about what being a New Zealander really meant. However, it was not really until the 1970s I began to link with Bruce, first by reading his wonderful journal, The Republican, and later visiting him in Auckland. Our dialogue was a part of a wider one in which a handful of New Zealand intellectuals were, and are, redefining the political economy of New Zealand. Its brash public face was part of the resistance against Rogernomics, but the longterm goal has been to construct an account of New Zealand consistent with our history and our values. The intent is not just to interpret the course of New Zealand but to change it. Tonight, I want to use the honour of being invited to give the second Bruce Jesson Memorial Lecture to continue that dialogue, by developing one of his central insights – the ‘thesis of the hollow society’ – and show how developing a textured society is central to nationbuilding. Bruce’s book Only Their Purpose is Mad, is pregnant with ideas but none was more exciting than this one. I used it in The Whimpering of the State, which I was writing at the time, and it also has a central role in my just published The Nationbuilders, which Bruce told me he was so looking forward to – except it is out too late. Making Bruce the subject of the book’s envoy is little compensation. While the notion of ‘the hollow society’ can be oversimplified to parody, subject to thoughtful caveats it provides rich analytic insights. It is not arguing that New Zealand society is empty. Rather the key notion is that because the government of New Zealand preceded New Zealand society, the social institutions did not evolve organically out of its people. Rather, many have been largely imposed top down by the central government, which has given a particular character to New Zealand which Bruce has called textureless or ‘hollow’. We might contrast the New Zealand experience of continuous government well before settler society had developed to any significant degree with that of Germany whose state goes back only to 1871, but whose social institutions began hundreds of years earlier. Bruce recognised his hollow society thesis was less true today than it was a hundred years ago. Another important exception is that the Maori social institutions are older than the New Zealand government. The theory also recognises that some of the ‘hollow’ has been filled by foreign institutions. Very often government sponsored institutions were created in order to replace foreign ones. The theory enables us to explain some salient features of New Zealand’s development. What captured me was how it explained why there was so little formal resistance to ‘rogernomics’, despite it being an anathema to a large majority of the population. Because so many institutions were beholden to the government, they could not express the people’s opposition to the government. But the power of the thesis is much greater than just explaining the lack of institutional resistance to Rogernomics. Consider the development of the union movement. The beginnings of unionism in New Zealand are traditionally associated with Samuel Parnell demanding a 40 hour week in 1840 on the Petone foreshore.4 A Sunday morning meeting outside Barrett’s Wellington pub in the following October resolved ‘that 8 hours shall be the working day, and that anyone offending shall be ducked in the harbour’. There were various industrial disputes throughout the land in the 1840s, including some which involved the Maori. Unions popped up in the 1850s, but it is not until the 1860s that we get the first unions whose descendants remain with us. Not surprisingly, their inspiration usually came from Britain, with names and rules copied from there. Some were branches of British unions. Initially the unions were small, fragile and fragmented. But they reflected the working communities which they represented. Some of the most significant involved seamen, watersiders, miners and railwaymen, who came together in late October 1889 to form the Maritime Council, which covered a third of all unionists. We commemorate the Council in yesterday’s Labour Day, its date being chosen to commemorate the Council’s founding. It chose that date to link with the October 1840 meeting demanding the eight hour day. The Council had close links to the Maritime Council of Australia, which got involved in a bitter industrial dispute in 1890. The New Zealand struggle lasted 77 days, ending in complete defeat. Weakened by the depression of the 1880s, and broken by the strike, unions took a lower profile for the next few years. But if working men and women had lost on the industrial field in 1890, the election of the Liberal government with a commitment to workers gave an alternative way forward. (The secretary of the Maritime Council, John Andrew Millar, now an MP, chaired the parliamentary committee which introduced the Labour Day holiday in 1899.) In 1894 the Liberals passed the Industrial Conciliation and Arbitration Act whose objectives included the encouragement of unionism. For the next hundred years the union movement was torn between those who saw the Act as a means by which unionism could be promoted, and those which saw it as an industrial leg iron. Instructively, the unions which most wanted to break away from the statutory framework were those that had arisen organically from specific social conditions which reflected the workers’ lives – the seamen, watersiders, miners, who had earlier formed the Maritime Council. The tension was sharpened after 1936 when compulsory provisions for union membership were enacted. Once an award was established, everyone in jobs covered by the award had to join the union. The resulting union structure was haphazard. A single union could have a minor role in a dozen industries: a dozen unions could organise the same site. Demarcation disputes were common, and they don’t contribute to solidarity. Since the new members were easily recruited, there was no great need to respond to their specific needs. Often it was impracticable. In 1983 the clerical workers’ unions had 50,000 odd members on 20,000 work sites. Nor need the new workers be enthusiastic unionists. Between 1981 and 1990 turnout at annual general meetings of the Northern Clerical Workers Union was always under 5 percent of membership, and only 20 percent took part in the 1989 postal vote to elect the executive. Compulsory and quiescent membership was not unattractive to some union officials. All they had to do was to be re-elected by the few associates who turned up at meetings, and take in the compulsorily levied union fees, collected by the employers.5 The union ‘becomes a bureaucratic, fee collecting machine, dependent on compulsory unionism and the arbitration system and devoid of membership support.’ Of course not all union were such creations of the government. Some were deeply embedded in their social fabric. But the existence of these statute-created unions markedly changed the nature of the union movement. Unions were not unaware of the effects of the changes. In The Nationbuilders I explore Bruce’s notion of ‘the historic compromise’. In the 1930s and 1940s Big Jim Roberts of the watersiders, Angus McLagan of the miners, and Fintan Patrick Walsh of the seamen all threw their lot in with the Labour Government, believing they could get a better deal for workers by using the powers of the state. This requires the state to be considerate of workers’ aspirations. Walsh learned in the 1950s that the historic compromise was much more compromising when the government was less sympathetic. The militant unions were not just shackled by the provisions of the law, but their room to manouevre suffered because solidarity required they recognize the concerns of the statute created unions, which could only survive with government legislation. This tension came to a head in the 1980s. With a Labour Government, the union movement was able to some extent to look after itself in regard to the Labour Relations Act, although the public sector unions were steamrolled by the State Sector Act. But they found themselves unable to challenge other changes, no matter how unacceptable they were to the public which the unions represented, and the wider republic. After 1990, with an even less sympathetic government, the unions could do little about opposing the Employment Contracts Act. Despite the claim that the legislation was neutral towards unions, the ECA was anti-union, making it very difficult for unions to function properly. The International Labour Organisation concluded that the ECA infringed international standards. The effect of the ECA was to dramatically change the union structure, halving the number of members and destroying a number of unions. The eliminated unions were those which were most the creation of statute, while those unions which had a organic relationship with their members survived, albeit in a diminished form. In an important way the ECA has had a positive impact on the union movement, for unions which survived are based on a close relationship with their members. The union movement did not demand a reversion to its old ways when the Employment Relations Act was being implemented. They recognised that statute-created unions hinder their development, so there are no compulsory coverage provisions. When a right wing government comes along to replace the existing legislation, the union movement will not collapse as it did 1991 but have an independent base in the community. That does not mean that governments now have no role in industrial relations. Because the modern union cannot practically cover many workers in need of social protection, the state will have to enact statutes to protect those workers for whom there is not a suitable union. So while the union movement is not turning its back on the government, and is still willing to operate as a partnership, it no longer trusts that government will act eternally in the interests of workers. By looking for a power base outside the government, in the voluntary support of and enthusiasm from its members, it is looking to the day when the government is again hostile to the interests of workers. By doing so the unions are contributing to the filling the hollow society – enhancing the social fabric. The story I have told about the unions can be told about many other social institutions, whose dependence upon the government limited their ability to challenge government policy. When in 1989 two of the universities took the government to court, the other five universities did not join in. Given that Auckland and Canterbury won their case, the reasons for not joining cannot be that the legal case was weak. It seems that some of the other universities felt themselves so dependent upon the government that they were unwilling to challenge it, even when they were in the legal right. The same story applies to local government, where again it has been rare for there to be serious resistance to the central government’s impositions. The area health boards never had a chance, their elected representatives eliminated in a single sitting of parliament. So many of the social and political institutions were dependent on the government, they could not convey the people’s dismay at the pursuit of policies which the public firmly rejected. New Zealand had evolved a government predicated on the assumption that it would act in the people’s interests. For most of the time it has been manned by an elite, who maintained some sort of empathy with the average New Zealander, perhaps recalling the hardships they had gone through before they became powerful. But it was, in Lord Hailsham’s phrase, an ‘elected dictatorship’. It worked as long as the dictators were benevolent. Less benign dictators were able to impose their will virtually unchecked. When terrorists took over government institutions designed for protecting the community, they could turn the guns on the people. In the last decade the governmental arrangements have been changed to prevent such takeovers. That is the purpose of MMP, which hobbles the ruling powers by requiring two or more parties in government, thereby shackling potential terrorists. Additionally, as we saw with unions, some of the social institutions are now less dependent upon the state for their existence. There are more local authorities willing to stand up to arrogance from the centre. Even the universities have been less feeble recently. And to give the government due recognition, its current proposals for the reform of local government, the re-establishment of local involvement in district health boards, and the new structure for TVNZ, add to the independence of these institutions and the social texture. The vision of the ‘Tomorrow’s Schools’ reforms was that empowering the local community in the running of their schools, would protect them from predations from the centre.6 The shift was all the more intriguing because it took place during the greatest intensity of Rogernomics, and was diametrically opposed to it – one of the earliest counter-terrorism strategies. Perhaps the reforms were not as successful as the minister intended – therein lies an interesting tale of the reluctance of the centre to devolve power – but it was an attempt to base a social institutions more on people and their communities. Curiously, Rob Muldoon had alerted the Rogernomes to the dangers of the hollow society, and they embarked on a strategy to reduce the businesses’ dependence on the state. Theirs was an ahistorical vision, ignoring how the state had accumulated its powers in part to offset the power of business, and in part because business could not deliver what the nation desired. Many of the businesses they privatised had become state owned assets because of business failure, or to counterbalance the powers of foreign business, or a means of restraining local monopolies. Although the public may think it a dreadful failure, there is a sense in which the Rogernomic program to restrain the power of government was a success. Unfortunately the transfer of power was to foreigners operating through their branch businesses. That is fine if you are one of those businesses or one of their well remunerated acolytes, but it is less beneficial to the ordinary New Zealander. In today’s political environment the Rogernomes are able to run a sustained campaign against the government, albeit without success in reaching ordinary New Zealanders. One assumes they aim to return to power and turn their guns on the public again. No wonder they loathe MMP. Ironically then, the broad effect of the Rogernomic revolution was to further hollow out society. Certainly the business community is less dependent on the state than it was two decades ago, but it is less a part of New Zealand society. You can see this in that membership of the BRT which has changed from being predominantly New Zealand producers to foreign financiers in a couple of decades. One of the consequences of the current bout of globalisation will be a diminution of the role of the nation-state. The increasing requirement to tackle public issues in an international framework means that some of the powers of state will be passed to supranational agencies. That need not always be a bad thing. The union movement will not hesitate to obtain ILO support when there is another legislative attempt to impose ECA type industrial relations. In fact, the nation-state is a recent arrival on the global scene. It seems to come out of the nineteenth century process of globalisation-industrialism. But recall that Germany, among others, was a nation-society long before it was a nation-state. While some may regret the diminution of the authority of Germany as the European Union evolves and as other supranational authorities become more powerful, there will remain German-society and German-culture, for centuries to come. We know organic communities and cultures can survive for a hundred and more years in a hostile environment: witness the Jews, witness the Maori. The difficulty which New Zealand faces is that because the state preceded society, we are currently dependent upon it for too many of the institutions of our society. As globalisation reduces the power of the nation-state, government created and sponsored social institutions must suffer. But that is not a consequence of globalisation, it is a consequence of the hollow society. As New Zealand becomes a more textured society, we have less to fear from this aspect of globalisation. The conclusion then, is that New Zealand needs to move on from the hollow society for two main reasons. The first is to limit the ability of terrorists to command the state against the interest of New Zealanders; the second to ensure we have a fully functioning society despite the significance of the nation-state being reduced by globalisation. How can we achieve these goals? Bruce saw nationbuilding as a key element, although when he wrote about it in his very last essay, ‘How to Build a Nation’ he was gloomy about New Zealand’s prospects.8 I do not think this reflected his health, for his natural cheerful self lasted to the end. Rather, the pessimism had accumulated over the previous twenty years as he watched terrorists tear the nationbuilding state apart. I understand his gloom but would like to be more optimistic. My book, The Nationbuilders, shows how a couple of generations – our parents and grandparents – built the nation over the middle half of the last century. We can learn from them, and pray for their courage, competence and commitment. Even so, this century’s nationbuilding will be different from the last. New technologies and new products change possibilities. The next round of nationbuilding will not be simply a matter of defining a mature relationship with Britain and the United States. It will have to struggle with the complexities of today’s globalisation. And we will have to respond to new personal, social, and political demands. The postwar world unleashed the importance of human rights. Affluence has meant we can be afford to be more concerned with the environment. A major challenge is how the Maori fit into the New Zealand nation. I did not find much evidence of Maori as a part of New Zealand twentieth century nationbuilding, partly because they were building a Maori nation (or nations). It is unclear what a Maori nation might be, especially as globalisation is changing the very meaning of ‘nation’. More broadly, there is a whole challenge of building ethnic diversity and tolerance into the New Zealand nation. As big a challenge is building a society which recognises the different situation of women. There were important women in the twentieth century New Zealand but again they were not closely associated with nationbuilding. It was a ‘white boys’ engineering thing’, and others often felt excluded. The articulation of a vision of this millennium’s New Zealand in which men and women – white, brown and yellow – share their nationhood has yet to be made. I suspect that this is partly because the traditional war and rugby symbols of New Zealand do not grip women as much as they do some men. Yet women can feel as passionately about New Zealand. They may have different symbols, but it is still the New Zealand of the nationbuilders cared about and struggled for. Allen Curnow wrote in 1945 ‘Strictly speaking New Zealand doesn’t exist yet, though some possible New Zealand glimmer in some poems and on some canvases. It remains to be created – should I say invented – by writers, musicians, architects, publishers; even a politician might help.’9 Actually every generation has to re-invent the nation, maintaining continuity and yet responding to changing circumstances. The essay, which is a foreword to a book on the universities, goes on to discuss how so many people in intellectual occupations fail to function as intellectuals, and indeed how they are even anti-intellectual. That especially includes the Rogernomes, who followed Lenin’s dictum that after the revolution first shoot the intellectuals. If nationhood is about a common set of symbols – that is the best short definition I came across when I was writing The Nationbuilders – then as Curnow argued, it is the function of intellectuals to create or sustain them. However the Establishment will only tolerate a limited degree of dissent, insufficient for an intellectual to function properly. Thus the hollow society is inimical to proper intellectual activity, and the hollowing out that occurred in the last twenty years has made it even more difficult. For example the quality of the indigenous economic debate is vastly inferior to what it was two decades ago. Those in the private sector speak from the viewpoint of their employers who are usually branches of foreign firms. The academy makes hardly any contribution, perhaps because of the high proportion of foreign appointees, while government documents rarely refer to New Zealand research, but slavishly report American studies which are often irrelevant. We can be obsequious to second and third rate foreign visitors, even when their contribution is irrelevant to local issues. How can we have a nation when its intellectual workers strangle real intellectual endeavour, while adopting a colonial demeanour? There is no simple prescription for nationbuilding, but I am sure that this time it is not a matter of reinforcing the powers of the state, except insofar as it is necessary to use them to offset pressures from business and foreigners. Rather by replacing the hollow society with authentic indigenous social institutions, we enable the nation-society to develop even as the nation-state retreats. So my first recommendation is that we should pressure central government to devolve power to potentially viable community institutions. But the experience of Tomorrow’s Schools tells us there will be much resistance from the centre. Second, we need to refrain from always expecting the government to do things for us. This is not the New Right philosophy which says the government is a block on progress, a view inconsistent with the historical facts. But they were right when the saw the tendency to turn to the government as a first resort, rather that using it after all other means of pursuing our goals have proved unsatisfactory, as a weakness in New Zealand political life. It detexturises society. The third element of the strategy is that each of us has to play the greatest possible role in the social institutions. The possibilities are large, but include being an active member of your union, your school council, and various local organisations and pressure groups, depending on your particular circumstances. It means attending meetings, volunteering assistance, paying subscriptions, voting, supporting it in public and private. Out of this comes my fifth and strategy penultimate step. We need to regain the belief in ourselves as New Zealanders, able to tackles our own problems without being obsequiously imitative of second and third rate foreigners. Of course we need to be in constant dialogue with the world, as Bruce was, but we can do that as independent equals not as cringing colonials. The worst anti-intellectualism is to ignore our own intellectual resources. My sixth, and for tonight, final element is the need to control the social surplus, that part of output over which a society has discretion to spend on its own purposes, rather than routine maintenance of living, which enables a people to maintain some control over its future. Some of the surplus will go into capital formation, some into education, some into health, some on culture, some on the fripperies of life (and why not), and so on. Until social institutions have discretion over resources they cannot function effectively and autonomously. Historically New Zealand resolved the problem by the state commanding a share of the social surplus through taxation. Thus the social institutions became dependent upon the state, because the state held the purse strings. Hence the hollow society. When the state gave up some of its control over the surplus, it gave it to the rich and the corporations, so it is they who now make the discretionary decisions. They are not all bad ones, but the outcomes are not all ideal. For instance there is much commendable in the substantial flows into the world of the arts from rich patrons, although I would like to see more emphasis of authentically indigenous efforts, and less on imitative international ones. Similarly universities are benefiting from financial flows from corporations making them less dependent on state funding, although I wish more of it was for the liberal arts and sciences, and other intellectual activities, and less was for business schools. But part of the social surplus comes from the activities of ordinary New Zealanders. When you do some voluntary work for your organisation or pay your subscription or give a donation you are enabling it to function with greater discretion. When you purchase a book or subscribe to an independent journal, you are promoting intellectual effort – often genuine intellectual effort. – enabling the organic institutions to command a greater share of the social surplus. Thankyou for the opportunity to develop the idea of the hollow society and the need to develop a more textured one. Thankyou too for the opportunity to pay tribute to Bruce in doing so. He would be delighted with such an occasion, not only because – I hope – he would see it as developing some of his ideas, but because the Bruce Jesson Foundation is an organic institution in its own right, promoting the ideals he valued so highly. The memorial lecture is a venue which offers a New Zealand intellectual the opportunity to constructively criticise economic, political and social life, without having big brother the state or big brother business limiting what can be said. While Aucklanders should name the second harbour bridge after Bruce for his contribution to infrastructural funding through his stewardship of the ARST, I suspect he would take greater pleasure in this annual lecture. And if I have conveyed anything of the need to build self sustaining independent organic institutions for the survival of New Zealand, the following thought will occur to you as you leave the lecture hall and pass the buckets inviting a koha. Bruce’s memorial lecture depends on a share of the social surplus too. So any donation you make is not simply a way of saying thank you to the organisers of this event, as I do, but it is also an investment in the promotion of a selfsustaining socially organic institution. I know you will give generously – for Bruce, for New Zealand.